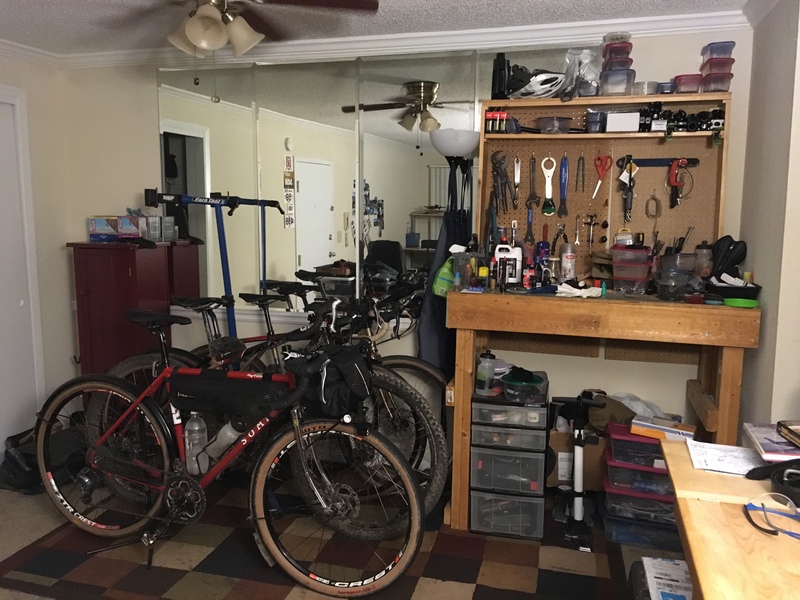 This is the clearest my bike mess has been in months, just wanted to share. 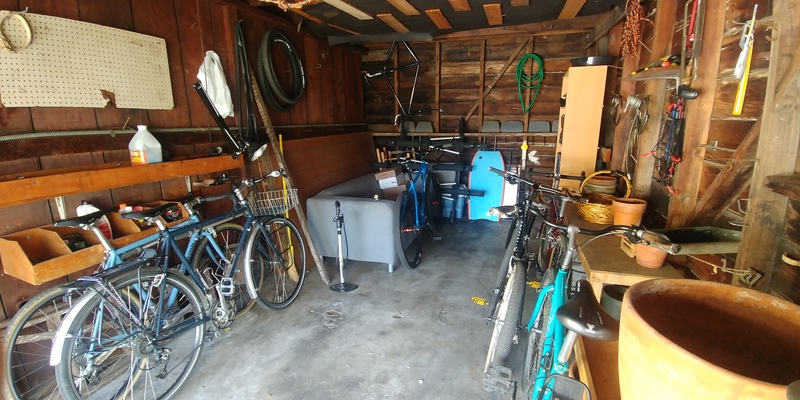 I’ve decided to start the neverendimg process of dithering on my bike storage. So far I’ve decided to mount the bikes flat against the wall rather than sticking out. I’d like to mount them some way other than hanging by the top tube on hooks. I’m seeing these pedal hook deals, anyone use them? It’s a very carefully cropped photo. I’ve actually been thinking about putting mine in the shed “Japanese shop style” with the stem loosened so you can rotate the bars 90° . That’s not a bad idea to save space if I’m not going to ride a bike for a while. Starting from the black shelves on the left, this used to be my bike mess. I miss having unfinished basement space to work on bikes. Now I’m trying to figure out how to get nu place all setup. No place for bikes inside on the main floor. Only “basement” space is a cellar that’s only accessible from outside the house. So six bikes and all supporting stuff needs to be in a two car tandem garage with garage doors on either end. Flat against the wall, and maybe hanging a bike in each corner, is probably the best approach. They rotate handlebars 90 ° so the bikes take up less room. 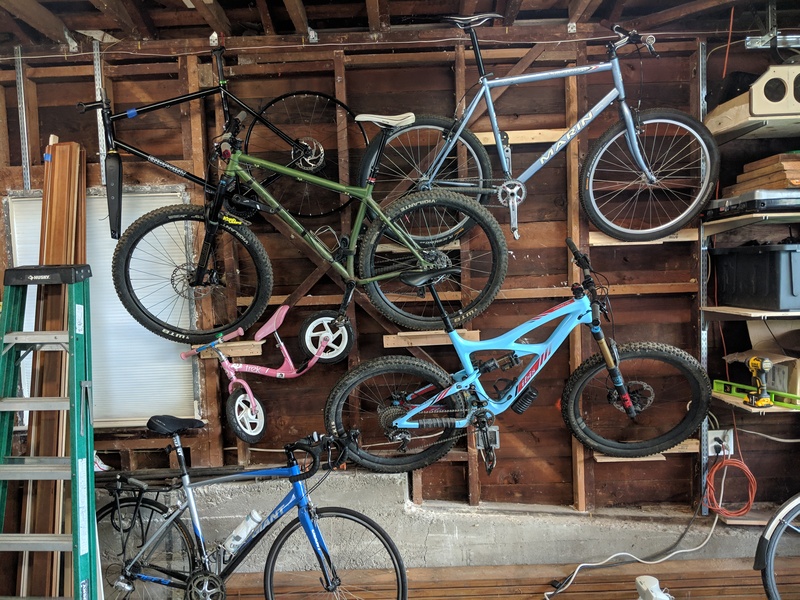 That part I got, just wasn’t sure if that was done for more density (more bikes hung closer together side by side) or just to take up less space out from the wall. I use one of these to store my 2 bikes in my room. I like them a lot for storing bikes in a tight space, but it gets hard to get the rim under the hook if your tire is bigger than about 2.25. You can get creative about staggering them and hanging bikes alternating upside down-right side up so that they fold pretty flat against the wall without handlebar interference. It was just about floor space eh. It was at a premium in Tokyo for sure. Would only really work if you had bikes that were not being used for long periods I guess, which is not really me. Except for my TT bike, which would actually be wider with bars rotated. I think it would be perfect for me, my hardtail gets ridden in the mud and my squish bike sees dry conditions. Just built up a new torture device that will only see summer time use. Just having one or two bikes tucked up high and away without taking up too much space would be a game changer for me. Here’s mine; takes up 1/4 of the square footage in my apartment. I’ve also got a track bike, mountain bike and fixed gear conversion in my kitchen but I don’t ride them regularly. 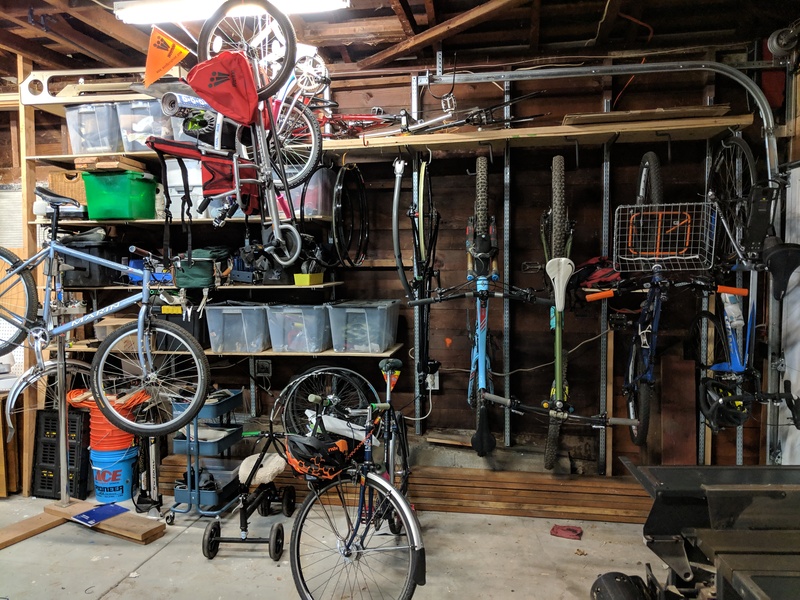 Current bike/etc mess. Two more bikes are in the house. When it stops being cold I’ll start caring about it more. Figuring at consumption levels from June last year until now, there’s about six years worth there. And the five+ rolls of blue towels is probably good for two years. WTH it just took me 45 minutes to find my fender stays. Bike mess is less messy now. Things are looking different in the mess today. These pedal hook things are neat but i can’t move bikes from hook to hook and I needed to re-hang the mountian bikes after swapping pedals. I’ll probably end up with one or two bikes up on these things and the rest stored in a more traditional way. Can I see a closeup of how the pedal hook holds the bike?